As many of you read through the entries for the SkepticBlog from all of these talented minds, you probably see many references to The Skeptologists. I’ll assume for a moment that many of you already know what The Skeptologists is all about. Since the start of the blog, many new readers are undoubtedly trying to figure it out. 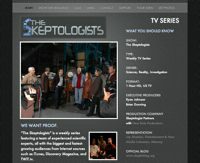 Today, rather than writing a long blog here, I’m going to invite you to take a look at the newly refreshed Skeptologists Website. This past weekend, I spent a few hours giving our Official Show Site an overhaul, adding details about the theme of the show and giving some never released details about how the program will be presented. You don’t get it for free however, It will cost you a minute or two. Once you’ve read through the website, please take a quick moment to make a comment on the “Your Turn” page so that those who come through afterwards (including TV execs and agents that we send there) will understand just how much support we have for a skeptically-minded TV program. I hope you enjoy the site, and look forward to your comments. If you see any typo’s or encounter technical problems, please feel free to email me directly. I’ve greatly enjoyed reading the comments from my last post about the Quarter Incident at the Queen Mary. The discussion, the lines of thought and the way that people differ in their analysis of this event is one of the things that I most cherish about the power of my line of work. I love being able to be the catalyst for that. You know, It continually amazes how much utter garbage is on TV. The work to getting something like The Skeptologists that is not only entertaining, but is thought provoking and dare I even say it aloud: “educational” on TV is stupendously difficult. The problem that we (And I mean we as Skeptics) really have is that we’re not cool. Ah ah ah, don’t even start… Nope, we’re not. Granted, there’s a few that tip the scales towards coolness, and heck most of you all are some of my biggest heros! I am humbled by the intellect, provoking discourse and ability to wrangle science like a frontier cowboy. BUT! Compared to the stars of the entertainment world, sports, politics and just pure celebrity, we don’t got it. Well, not yet anyway. I’m not worried though. That’s not what it’s all about. The issue however is convincing the TV execs that in this case, the star power is truth and science! They want celebrity-star-power and a sure fire hit. One reality that is very evident by the response that we get as we work through the process of selling the show, and other projects that I’m working on is that no exec will put his or her individual neck on the line and go to bat for a show anymore. They want consensus, unanimous opinion and a way to point both their fingers in opposite directions and say “it was their fault” when the ratings start to fall, as they eventually will, no matter how good a show you have. All the TV executives want a clear and unobstructed way out. If you watch a few hours of network prime-time, you’ll quickly understand why everything pretty much looks and feels the same within a few major genre’s… They all can point to another show and say “But American Idol was a hit! So America’s Got Talent has GOT to work!” Everyone around the big mahogany table nods appropriately, and bang-o you got a network deal. As promised, our guest blogger, Shawna Young filling in for me this week to give you her perspective on her part of the The Skeptologists pilot shoot. Enjoy! Hello everyone! First, I should apologize for my lack of blog last week, the Chicken Pox as an adult are not fun, and my sense of humor was a little thrown by all the itching and whining. Also, this is the first blog I have written so I guess I should start with a bit of an introduction. My name is Shawna Young, I have worked for New Rule Productions for about 9 years and worked as a Coordinating Producer for “The Skeptologists”. I very much enjoyed this group of people, talent and crew alike. I learned a lot, and am looking forward to working with them all again when the show gets picked up. I ran across a comment on the blog that I wrote last week. It caught my interest. Not to say you guys won’t get there, but . . . I don’t know; perhaps it’s where I live, but I don’t often meet people who would be considered your target audience. Quite the opposite, in fact. I thought about it for a bit, and wondered, why would he make that type of comment? It didn’t take that long to realize that what is happening at least in terms of Ejdalise, is that many people don’t really understand our goals and intentions for this program, and thus think that we are aiming to create a show that is aimed at our smallish, yet active skeptical community. This is just not so. In order for a TV series to be successful in a “real” way that’s judged in the scale that will even make a blip in the Nielsen ratings, one must create a program that is consumable on the national, dare I say, international, scale. Too bad really, because that means that we have to create a show that must be, hmm how to say this correctly well… just easily understood by the general TV viewing audience. Creating a Television Series is Hard. All the elements of TV production are difficult and require much attention, time and money. Landing a network TV production deal to have the opportunity to show all that hard work to a nation, and even the world, is much like hitting the lottery. Too bad I don’t play the lottery. Convincing entrenched, and complacent programming TV executives that you have a program that will change the way people consider their TV entertainment seems to be next to impossible. I set out on a journey to do just that, and with the help of an amazing production team and an all-star skeptical cast, we’re going to make it a reality!